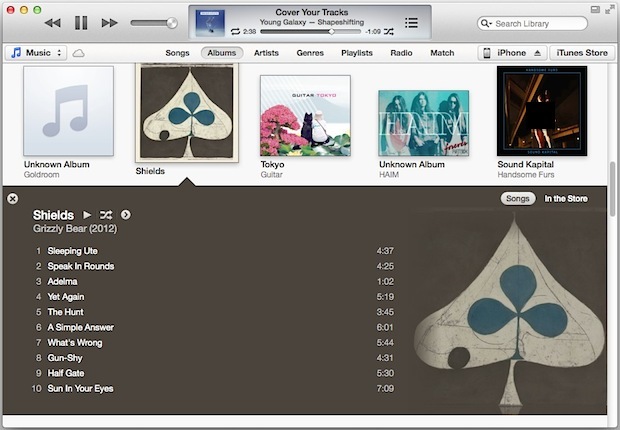 iTunes 11 Released, Download Now! iTunes 11 has been released by Apple, offering a fairly significant update to the music player and iOS device syncing app. A variety of new features have been added, the user interface has been redesigned and modernized, a new mini-player has been included, and there’s even a redesigned icon to go with it. This is the first major update to iTunes in quite some time and is available for both Mac OS X and Windows users. If you find any particular method unavailable, downloading directly from Apple should work without incident. Entering email addresses is not necessary to get it from Apple, clicking the giant blue Download button is sufficient to start downloading the installer. How can I resize the albums in album view? But the MiniPlayer now is really better and useful. I would replace Normal in this title with something different. New or different does not mean not Normal. The new logo reminds me of 2001: A Space Odyssey. This software is aware of itself. I’m scared. I really do like the Up Next feature. It tells me what song(s) are coming next so that I don’t have to remember or guess (depending of if I hid the playlist, or if I shuffle my music). In my opinion, I’d just leave it. No rearranging, removing or adding any songs to Up Next. Oh, I have to say, support for Leopard (that includes PPC Macs!) has been ditched since 10.7. 11 Remains that way. Knowing how Apple dropped support for PPC Macs in late 2011, iTunes wasn’t until September 2012.
iTunes 9 ditched G3s, speaking of “even further back”. Here are some more “ditch me to win” updates. iTunes 5 ditched Puma. Luckily 6 didn’t drop support for Jaguar. iTunes 7.4 ditched Windows 2000.
iTunes 11.1 MIGHT ditch BOTH Windows XP and Snow Leopard. I typed this on Snow Leopard anyway… I’m risking it. I hope I CAN update to 11.0.1 and newer. But…! I will use Windows soon as I’m moving over to it. I might get a couple of new updates on it. And I prefer iTunes to Windows Media Player. Whoops! I forgot that iTunes 10 ditched Tiger! OK, so what are the minimum/recommended system requirements and footprint for ver. 11 vs. ver. 10 and why should one intentionally get a slower version that bogs down their computer?